At the beginning of 1960's Sukhoi Design Bureau finished to develop its new fighter-bomber Su-7B («Fitter») and another important task arised — to make two-seat training variant of this type. This objective was urgent because Su-7B was hard to control, especially on landing and critical flight stages. Two-seater, designated Su-7U («Moujik»), destined to make training process easier and quicker for pilots. Nevertheless Sukhoi team managed to release first Su-7U prototype only in October, 1965 due to its high workload connected with evaluation of Su-7B and another projects. Trainer was a bit longer than Su-7B, also was unmounted one of the two cannons in order to reduce weight. The rest of the armament remained mostly the same. Crew seats were located behind each other under the separate canopies. Rear canopy was equipped with large retractable mirror to improve instructor's field of view on take-off or landing. Also instructor had full set of instruments and controls and was able to interfere in flight whenever he decided. Emergency ejection system allowed crew to leave aircraft in dangerous situations separately and safely. Su-7U production commenced at Komsomolsk-na-Amure Aviation Factory in 1966 and continued till 1971, together with Su-7BKL and Su-7BMK manufacturing. 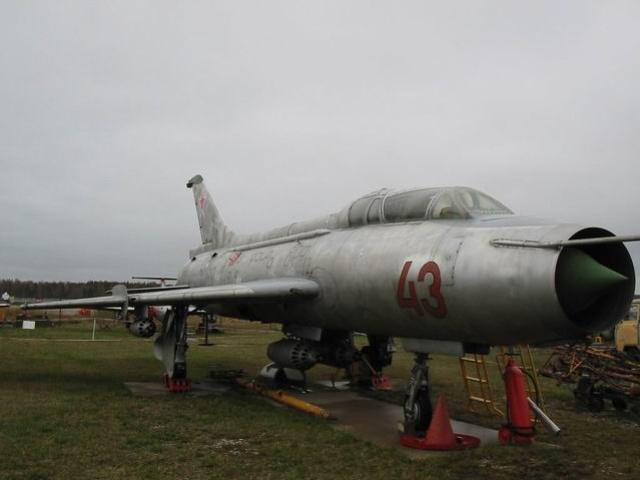 Two-seater' export modification Su-7UMK was bought by Algeria, Afghanistan, Egypt, India, Iraq, Syria, North Korea, Poland, Czechoslovakia and took part in 1970-80's wars and conflicts. Soviet Air Force used Su-7U for very long time — till beginning of 1990's, because of its similar performance with Su-7B's successor Su-17. Museum's Su-7U serialled 43-red and has production number 2318.